The use of algae and algae fuels does have a role in the human future, however far less than the unrealistic and unproven claims of media and entrepreneurial hype would suggest. Algae's role is not as a primary and stand-alone energy producer, but rather as a nutrient scavenger that is used to recover waste nutrient and energy from very site specific industries that produce organic wastes (intensive land based agriculture, aquaculture, CAFOs, food processors and others). The use of commercial primary algae fuels - and for that matter most other biofuels are not sustainable because of algae biofuels at-scale dependence on peak oil and peak phosphate based NPK fertilizers. The same as, and necessarily competing with - 95% of global human food production dependent on these same non-sustainable resources. Algae will not solve the global energy crisis, but it can make food cost more efficient (reduce aquaculture production/feed costs - with systems like ISRAS) while reducing waste and pollution and produce limited amounts of energy at optimally located point source pollution. Algae and other biofuels are limited by logistical, spatial, climatic, and seasonality of potential sites such that only about 3% of the nations wastes are available to it for sustainable energy production. How algae can be used in agriculture, aquaculture and other similar industries are detailed on this and other pages on this web site. The use of algae bio-fuels as a significant replacement to petroleum is an economic and strategic non-starter even for proponents such as the US military – the world’s largest petroleum consumer. Apparently, the US military has never heard of mass balance analysis, or life cycle analysis, and they rarely have had to worry about the economic feasibility of anything. Even the most slow witted farmer will tell you that no matter what plant crop you produce commercially at scale, it requires petroleum, petro-chemical management agents, and phosphate based fertilizers (NPK) to replace the nutrients that those crops consume from the soil. So will the large scale commercial production of algae require petroleum energy, petrochemicals and NPK fertilizers. ‘Free sunshine’ it turns out is only a small economic component of the photosynthesis process. The rest of a photosynthetic based commercial scaled production process requires the use of non-renewable, non-sustainable critical resources like peak phosphates and petroleum derivatives in form or fertilizer, pesticides, harvest and transport fuels. While algae fuel proponents often say that algae will be produced on wastes, they don't consider the logistics, spatial, climatic and related economic limitations of that waste usage. Current estimates of waste product availability to algae production suggests that at best algae can provide about 3% of the current US energy needs using wastes. Regarding sewage waste - first consider that about 35% of the countries sewage ends up in back yard septic tanks. Then understand that almost no municipal sewage plants have adjacent land space for the development of algae production facilities and the transport fuel cost make it unfeasible to transport algae to more spatially adaptable locations. And, as the TV infomercials so often say "But wait, there's even more!" Algae production is a temperature and light sensitive process and much of the US doesn't have the temperatures or light levels for efficient algae production for much of the year. While it might appear obvious, the artificial illumination of algae production units - takes more energy than the algae produce because of the algae's relatively low level of Photosynthetic efficiency. Photosynthesis is only 2% efficient at converting light to energy in most field crops and estimated up to 8% in sugar cane. However, on an overall planetary basis the Earth's energy budget, shows that the total photosynthetic efficiency of the planet is 0.84% to 1.26%. Hopefully, this suggest to you why you can't make money artificially illuminating algae biofuel production systems - to generate energy from the algae, unless the energy of that illumination is somehow - free, and not needed for things of even higher priority. NASA's OMEGA project (which we are collaborators on - http://www.biocepts.com/NASAs_OMEGA_-_BCI_Collaboration/NASA_Poster_Algae_BioMass_Summit.html) makes the un-sustainability of algae and other biofuels using NPK fertilizers eloquently clear and drives home the problem of biofuels limits regarding spatial limitations. (See refs. below for NASA OMEGA's and Dr. Jonathan Trent's recent TEDX presentation posted on You-Tube.) While it's true that a more efficient waste capture and recycling infrastructure could be designed in the future - so that algae could play a more significant role in waste utilization, this could take 50 years or more, and that time horizon is not within our peak oil, peak phosphate, and associated peak fertilizer / food production crises' window of problem solving opportunity. 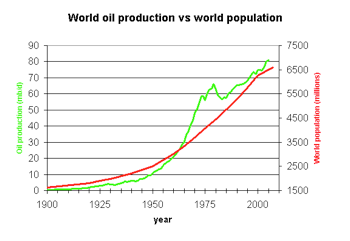 What is being critically left out of the global biofuel discussion is biofuels at scale dependence on chemical fertilizers - NPK (used in 85-95% of human food production). Even more, critical is peak phosphate - the "P" of NPK. In 2008 scientists estimated we had a 300 year supply of mineable phosphate reserves. By 2011 a little more careful analysis dramatically changed (realized Asia is now increasing their use of NPK) their conclusions and they estimated those reserves will now peak in less than 30 years and be completely depleted in as little as 50 years. This is a rather remarkable and very factual doomsday forecast for the human species as we know it. Most remarkable - it didn't even make the local news. I suspect that no one can actually predict when these critical resources will actually run out. However, Mass balance analyzes of algae and other biofuels clearly show that at-scale use of non-sustainable peak fertilizers in biofuel production is absolutely required to produce any serious amount of our offsets for our national energy needs. Another factor that can't be fully anticipated is the negative synergy between between peak petroleum and peak phosphate. Most of the Hubbert peak theory analysis looks at peak resources linearly, not what happens when they occur simultaneously say - like peak petroleum and peak phosphate. These analyses also potentially fail to predict the rise of higher protein food demand in rapidly developing high population density nations such as India and China. These complex and difficult to predict interactions between peak food production resource depletion, and growing consumer demand in developing nations - necessarily create higher probabilities for human catastrophe than individual analyses might yield and as well, create almost infinite possibilities for a perfect storm of resource (especially petroleum and phosphates)/food crises on a global scale. What most algae and other biofuel proponents are in denial about is that algae fuel and other biofuel production will compete directly with human foods for peak fertilizers. At best the direct biofuel competition for fertilizer would not only dramatically raise food production costs (as ethanol production has already demonstrated) - at worst biofuels consumption of peak petroleum and peak phosphate will decrease the amount of time available for our alternative energy problem solution - shortening its development window of opportunity - before food shortages and the resulting global chaos limits completely stops alternative energy development. Strategically it makes no sense to develop an unsustainable alternative energy technology such as biofuels that will lessen our ability to become more sustainable, much less survive the absolutely certain coming global food crisis. From a demonstrable and practical standpoint, we humans have not lived at sustainable populations since cheap fossil fuels and NPK fertilizers brought about massive crop yield increases begining in the late 1800s - which was the actual foundations of the Green Revolution. The human population then was about 2 billion. Today we are 3.5 times that number. In the next 30-50 years it is estimated we will add another 3-5 billion to our population. All the while we are adding people, we continue to deplete our global phosphate reserves and rising peak petroleum fuel prices increases the cost of production of the remaining phosphates. These are neither good nor sustainable trends. While we may well develop ways to re-capture phosphorus from our wastes and from the ocean, it isn't likely that any of these processes will ever approach the current low phosphate mining production costs - or be able to replace the phosphate minerals that we now mine that were deposited over eons. As one author put it, "we are consuming phosphorus faster and than the phosphorus cycle can replenish it." In truth the world faces a peak resource crisis and the most critical of these resources regarding our survival will be the scarcity of those resources needed for human food production. While we may (and are) stretching our petroleum reserves out far past what the original Hubert peak resource theory estimates suggested, we are far more likely to run out of non-renewable, non-sustainable and critical phosphates before we run out of petroleum energy - especially considering the growth of alternative energy sources like solar and wind that will actually extend rather than immediately replace our petroleum supplies somewhat. However, without relatively cheap phosphates, modern plant based food production as we know it, will all but cease to exist in a relative short period/number of crop cycles. The military industrial complex (essentially the US government) isn't particularly noted for public minded strategies, but rather those of their own immediate interests. Their interest in biofuels is not economically based, but as a source of last resorts when and if petroleum is ever not available in the quantities that the military thinks they need. Any strategic mass balance - life cycle analysis of alternative energy sources will tell you that only solar, wind, tide, wave and (and possibly thorium nuclear energy (400 times more abundant than uranium and generally safer) related technologies can provide significant amounts of alternative energy that do not directly compete with human food production resources by consuming our obviously limited petroleum and phosphate reserves. The aforementioned alternative energy resources (excepting thorium) depend the least on earth based and human critical resources, and instead originate from off planet energy producing affects. Alas, adequate energy storage technology currently limits their wide spread economic application and implementation. The point here though is that the military's interest in biofuels stems not only from their recognition of peak oil (and their ignorance of peak phosphate), but also their recognition that any and all military confrontations - consume massive amounts of fossil fuels. 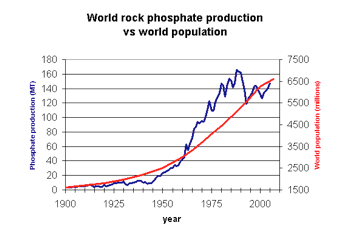 From the worlds resource/food crisis standpoint military conflicts rapidly shrink our window of technical opportunity and potential to solve our critical resource problems - particularly peak phosphate. The world is rushing head long into a global food production crisis that both the media and our leaders refuse to discuss publicly and it seems even more doubtful that they have the necessary knowledge to discuss it in private. In the mean time, politicians on the left and the right are squandering critical research dollars in return for campaign funding and other favors, and or with no priority regarding the oncoming resource/food crisis disaster. In any case, our leaders gross willful ignorance, greed, and casual shirking of the leadership responsibilities to their constituents will likely historically top any known human atrocities to date by orders of magnitude - when our modern food production systems fail, our food runs out, and human civilization is chaotically transported backward to somewhere between 1850 and the Dark Ages - in the best case. "Humans are fundamentally no different than yeast. We will consume all our resources and die in our own excrement - given the opportunity." Bytesmiths- from a message board.